Even a $230 billion business can surprise investors with quick strategic shifts. Procter & Gamble's (NYSE:PG) almost 200-year business history is a testament to its stodgy but powerful business model. The last few years, though, have produced a change of pace that shareholders might more reasonably expect from tiny upstarts -- not a $230 billion titan that was incorporated in the 1800s. Let's look at a few of the biggest differences between the consumer goods giant today and in fiscal 2013. Procter & Gamble is a far smaller company today. It counts just 65 brands across 10 consumer goods categories, compared to 166 in 2013. Most of the sold or discontinued product lines were small, but a few, like Duracell batteries, constituted major franchises. The multiyear brand shedding process, which management called P&G's biggest transformation in its history, has accelerated a sales dip brought on by a weak industry and minor market share losses. Revenue in fiscal 2016 was $65 million, down 12% from the $74 million mark it achieved in 2013. The brand shedding helps to explain why sales have fallen at a much sharper pace than those of its rivals. Kimberly-Clark (NYSE:KMB) competes against P&G in the key diaper category and has endured a more modest overall revenue slump. PG Revenue (TTM) data by YCharts. Yet P&G is happy with the strategic results so far, since the smaller portfolio is both easier to manage and more profitable. Despite the smaller sales base, P&G is producing roughly the same level of earnings today. In other words, it has grown significantly more profitable. Operating earnings last year amounted to $10 billion, compared to $10.3 billion in 2013. 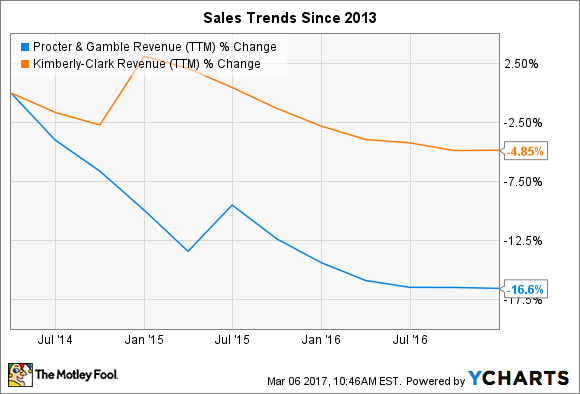 After accounting for the revenue drop, core operating margin is up by 2 full percentage points since that time to just below 22% of sales. P&G is ahead of most peers on this key metric, thanks mainly to an efficiency program that's squeezed billions of dollars out of its expense structure. Better still, executives are targeting a further $10 billion of savings through fiscal 2021 using aggressive moves that include reducing head count and manufacturing sites and simplifying the production process for all its brands. P&G's market share has decreased across its core categories in each of the last three fiscal years. Part of that awful result can be tied to circumstances well outside of the company's control. After all, P&G was more severely exposed than rivals to geographies that suffered economic slowdowns lately, including Venezuela, Brazil, and Ukraine. Also, P&G dropped the ball in a few key competitive areas. It wasn't quick enough to respond to competitive attacks in the razor industry, for example, and thus lost share at both the value end of the market and to subscription-based rival Dollar Shave Club. Ultimately, organic sales rose by just 1% last year, and even that disappointing result was only possible thanks to price increases, given that P&G's sales volume fell. The company's business model relies on its ability to outpace the industry in overall growth. Its failure in this fundamental area is the best single reason why the stock has trailed the market and rivals over the last few years. The stock's performance ahead will depend on whether management was right in claiming that its portfolio reboot will lead to faster growth and more sustainable profits. Based on the early data, investors have some good reasons to be encouraged. P&G is on pace to meet its long-term earnings growth outlook in 2017 after posting a 2% decline in each of the last two fiscal years. Its competitive losses are moderating, too, which could power significant gains for investors -- if the trend puts the smaller, more focused company back in position to soak up market share.